Located on Berry College’s sprawling 28,000 acre campus in Rome, Georgia, the new Cage Center is a 130,750 sq. 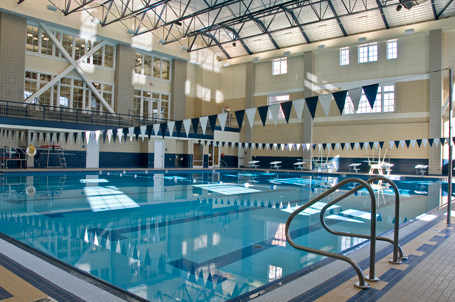 ft. athletic facility that features a natatorium, 2,000-seat intercollegiate sports arena, multi-activity gym, fitness area, indoor running track, basketball courts, racquet ball / squash courts and a general cardiovascular training area. Designed by Hastings & Chivetta Architects, the $27 million Steven J. Cage Athletic and Recreation Center began construction in June 2006 and opened in September 2007. Counsilman-Hunsaker was retained for their aquatics expertise to design the new 4,700 sq. ft. 25-yard competition with eight lap lane swimming pool with an observation balcony. The new recreation center provides a state-of-the-art home for intercollegiate and intramural athletic programs, as well as a natural gathering point. Recreational and social opportunities will abound within these walls, enriching the lives of Berry students for many years to come.